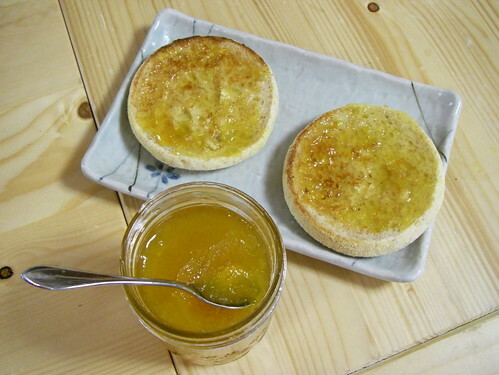 I liked the ume jam my student made so much that, knowing it wouldn't last very long, I decided to make some of my own. I couldn't find a recipe in English and the Japanese recipes and instructions I found online all varied quite a bit, which had me a bit confused. 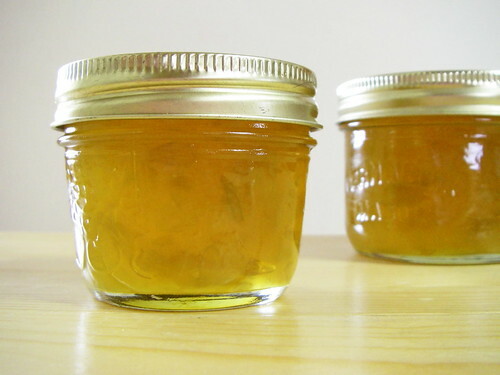 Normally I wouldn't worry so much because jam is a relatively simple thing to make, but ume (Japanese apricot, the fruit of Prunus mume) is bitter and toxic in its raw form and needs certain preparations to make it safe and tasty. So I winged it, and what follows is not the ultimate ume jam recipe--this is more of a proto-recipe, and is in desperate need of refinement. But since the season's ume are nearly gone (and I'm out of jam jars and lids) it will have to do for this year. Hopefully my lovely readers will have some helpful tips and next year I'll get it right. 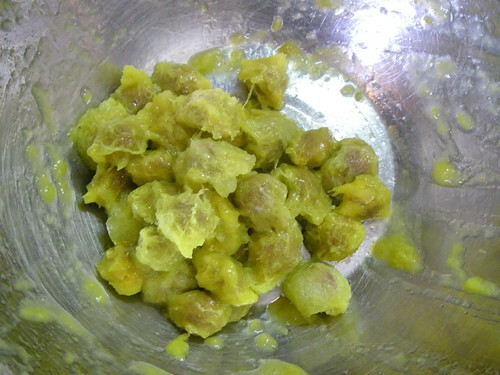 I used one kilogram of yellow ume and 500 grams of granulated sugar. I washed the ume and soaked it in salt water for three hours, then rinsed it, drained it and removed the stem remnants. Unlike with making umeshu I didn't have to worry about getting the ume completely dry. 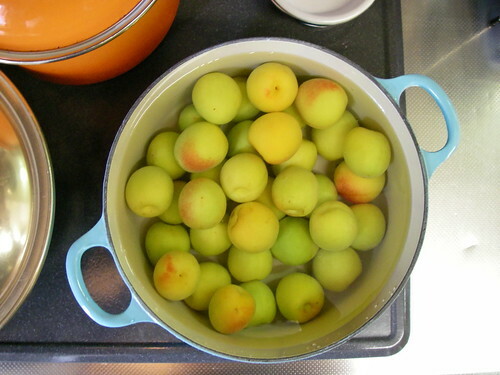 The ume were added to my lovely new Le Crueset pot (any enamel, glass or stainless steel pot would work) and covered with cold water, then brought slowly to the boil. The ume began to soften and the skin started to break as the water heated up, and as soon as it boiled the fruit was drained. I had planned on giving the ume two boils but I realized that the fruit was so soft that another boil would have disintegrated them. So I decided they'd had enough and transfered them to a bowl to mash them (not wanting to damage my pot with the metal potato masher). I gave the fruit a good mashing with a potato masher, which helped loosen the pits but didn't completely separate them. Ume are clingstones, which makes it hard to remove all the flesh from the pits--maybe I should check some plum or other clingstone fruit jam recipes for tips. 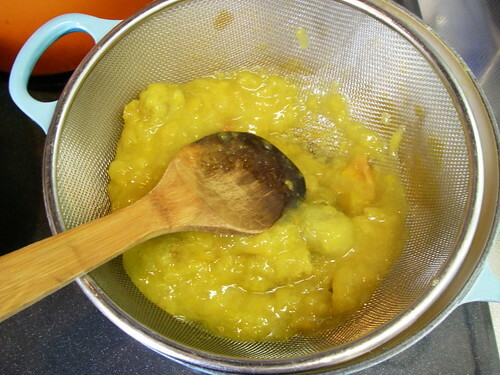 Stuck as to how to proceed, I poured the ume into sieve and tried to push the pulp through with a wooden spoon. This helped separate the pulp from the pits, but what came out the other end was too smooth--I like a chunkier jam. So for the rest of the pulp, I simply squeezed the flesh from the pits with my hands. Probably not the best way to do it, and it made quite a mess, but it did get the job done. And here is the half chunky, half smooth pulp. It looked good already so I had a little taste, but it was unbelievably sour. Definitely a sour plum flavour, so now I kind of understand why ume is often mistranslated as "plum" in English. The sugar was added and the heat turned on. I started out with 300 grams of sugar but after a taste ended up using the whole 500 gram bag, which was still very tart but more balanced. People who like a sweet jam would want to use more, maybe a full kilogram for a very sweet result. 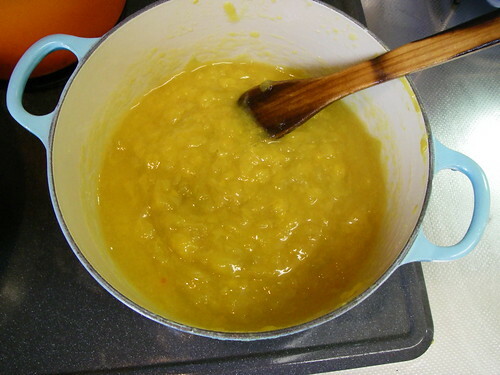 I brought it slowly to a boil and then simmered it for 15 minutes, stirring constantly. 10 would probably have been sufficient but since I'd only given the ume one boiling I wanted to be extra careful. 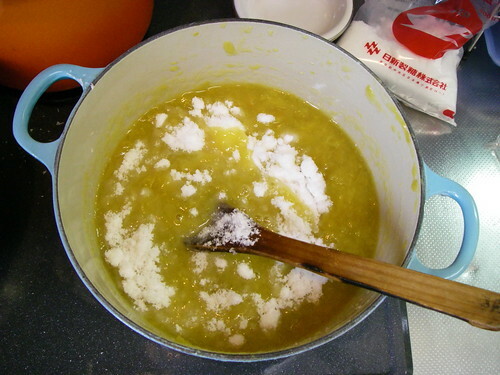 It produced a good amount of foam, which was removed with a ladle as the Japanese recipes instructed. I got tired of that though so in the end I just added a small pat of butter, a trick common in western recipes but apparently unheard of in Japan. Meanwhile, I had jars and lids boiling in two pots. They were all from home, having once contained strawberry, cherry and other jams made with my family on visits back home. The lids presented a bit of a conundrum, as I know you are not supposed to reuse them. 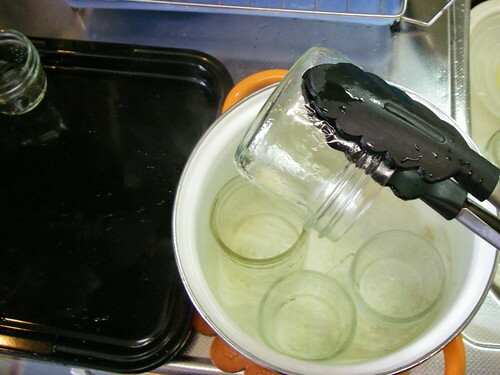 But mason jars with double lids don't exist in Japan, and while jam making is popular here it's not done with long-term storage or safety in mind. In fact, home-made jam in Japan is closer to what we'd call compote or refrigerator jam back home, with a soft, runny, ungelled texture. 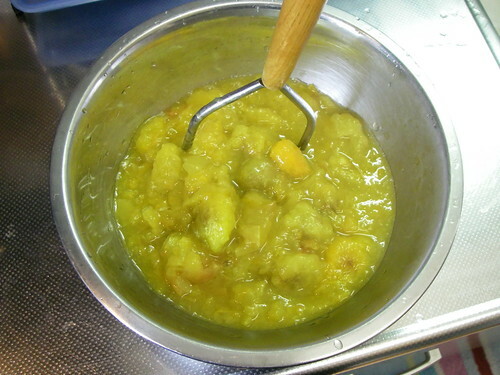 Little sugar is used (most Japanese have an aversion to overly sweet flavours), the cooking time is short, and the jam is poured into whatever containers are available, usually not sterilized. It kept in the fridge and meant to be eaten quickly. Very quickly--I've received a lot of home-made jam here in Japan, and it almost always goes moldy before I can finish it. So I figured that compared to the usual Japanese jam-making methods, re-using my double lids was a minor sin. I only ended up with 5 jars and I'm sure it will be used up quickly. Next time I go back home I will stock up not only on lids, but add a wide-mouth jam funnel as well. I had a bit of trouble ladling the jam into the jars and spilled a bit on the rims, which is another no-no. But after sealing the jars I heard five loud pings, confirming that all of the jars sealed. And this is what I ended up with: 5 jars of beautifully coloured ume jam. It set perfectly-- ume must be very high in natural pectin. I'd never made jam without adding Certo and had always thought added pectin was necessary for jam, so it was amazing to see this jam set all by itself. I just had to try some, so after the jam cooled down I spread a bit on an English muffin. And now I understand why ume are called Japanese apricots. The plum flavour had disappeared, the japm now had the colour, smell and flavour of pure apricot! Well, a very tart apricot, and one with a pleasant marmalade-like bitterness and nutty flavour, which I assume are from the initial boil of the whole fruit (some flavours from the pits infusing the flesh). I just if only I could find proper jars and lids I'd be out buying more ume to make several more batches. 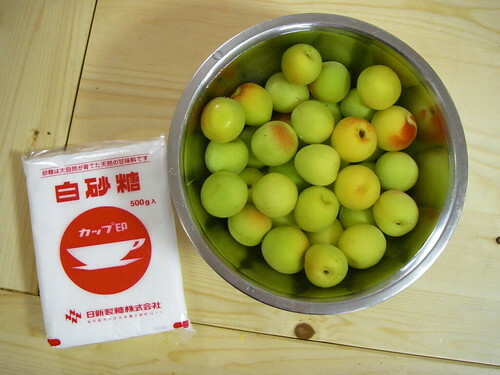 So I'll be trying this again next year, and also will try it with the ume leftover from my ume liqueur. And in the meantime I'd love to hear some ume jam making tips, or just some jam tips in general. What kind of jam are you making this year? hi! do you know if we can buy ume fruits in the USA? i called several japanese yasai markets but they don't have it or only have them in jars. I really want to make them, but would probably settle for just the jams. if only you could sell what you make. :) love your blog btw! That looks beautiful! I tried ume jam a very long time ago, and this just made me think that it would work beautifully with ham and a slice of cheese, (call me weird). 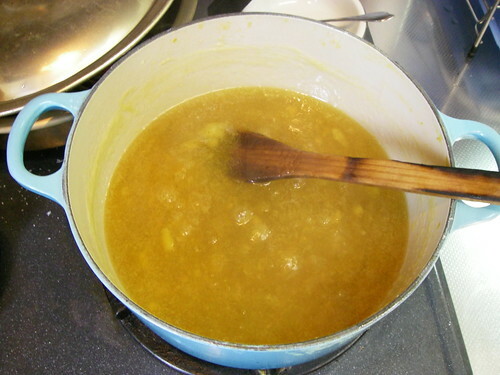 I did my first Seville orange marmalade this Feb and it refused to set. You did well on your first go! after i finish drinking the previous years umeshu i just pit the umes and mash and boil with some of the leftover rock sugar from the umeshu making. so easy! also i wanted to ask...you are very knowledgeable about plants, fruits, and vegetables. do you have previous knowledge of these subjects or do you research before your posts? either way i am always impressed and always learn something new! thanks! You can find ume in the United States! This year, ume were available at many Japanese supermarkets in California. Another option is to grow a flowering apricot (prunus mume) tree in your back yard. After reading the umeshu post on this blog, I set out to make some of my own (thanks for the inspiration!). I was lucky enough to find some fairly green ume in a Japanese market. After mentioning this to a friend, she discovered that she had three of the flowering apricot trees in her yard. 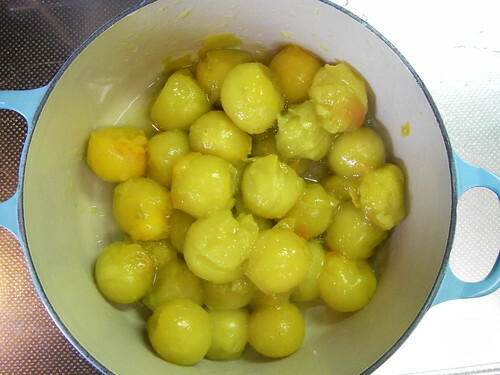 By that time, it was a bit late to make umeshu from her apricots (they were too ripe), but I used some of them for jam. It turned out quite well. Illahee, thanks for the offer! But without enough jars or lids to make proper jam and without the fridge/freezer space to store the ume I'm afraid I'll have to pass. I wonder if any other readers would be interested? Kinmei, check out Holly's post. I don't know where in the US you are, but maybe if you kept looking you might eventually find them. I wish I could send you some jam, but I've never found a good way to send jams through the mail--so far they've always arrived unset. Kharina, that doesn't sound weird at all. This would definitely go with ham or savory food. In fact I made a sauce for lamb last week with green ume jam that a student made me, and it went wonderfully. Saltie, are umeshu ume easy to pit? As for my knowledge of the plant world, I've been here for over 12 years so have naturally learned quite a bit. Food, flowers and gardening is also a favourite subject for my students, so I pick up lots from them. And finally, yes I do quite a bit of research before I post. That's actually one of my favourite things about blogging--I learn so much while doing research. Thanks for the tip Holly! So ume trees are called flowering apricot in the US? That's good to know! People who buy flowering apricot trees here are told that the fruits are strictly "ornamental" and not to be eaten due to their toxicity. Little do they know that great things can be done with the fruit. My friend did not realize that she had trees bearing ume until she saw the umeshu post on your blog. After a little more research (yay for wikipedia) we figured out that flowering apricot = ume. Needless to say, she and her family are quite excited. you can even find ume here in Michigan, although a small bag is pretty pricey. The jam looks wonderful! Great pics, as usual. Gomen, Illahee. I should have looked more carefully at who posted the comments. The question about ume in the US was from Kimmei. Holly, it's such a shame to think of all that fruit going to waste! 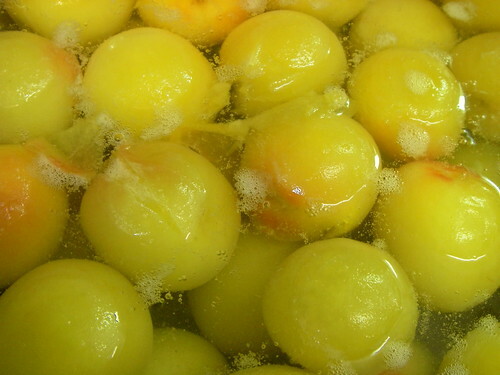 Other than umeshu and jam, people use the fruit for umeboshi (salt-pickled), "ume sour" (seeping the fruit in vinegar and a little sugar to make a sour health tonic) and ume juice (the fruit is covered with sugar, with a little alcohol or vinegar added, and steeped). AC, very good to know you can buy the fruit in Michigan. Thanks! And yup, Illahee was the one looking to get rid of her ume! Too bad takkyubin only works in Japan--it would be great if you could send them chakubarai to some lucky person overseas! Quince is another fruit with very high pectin. I've only made quince honey with it (another compote-y thing, I guess), but apparently quince jelly is very easy to make. this ume jam looks great. i made something similar with a bag of red and yellow ume. the fruit was boiled with water to cover for 15 min. after it cooled a bit, i removed the stones by hand, squeezing to release any flesh. (like you, though i didn't drain the water.) 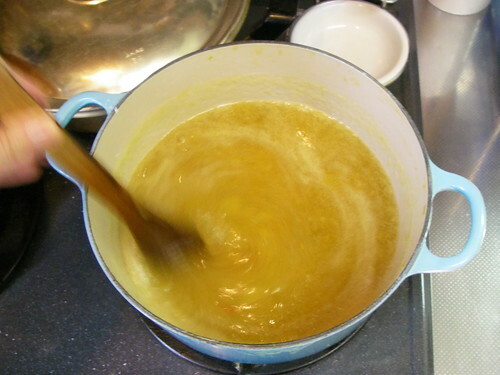 the mixture was then pureed, and returned to the pan with a bag of brown sugar. though i did splash in a little pectin, it was completely unnecessary in retrospect. i ordered jam jars from here: http://www.shinkoen.co.jp/life-shop/index.html. though they were sterilized and sealed in a water bath, you can't hear them seal... but they appear to be ok. 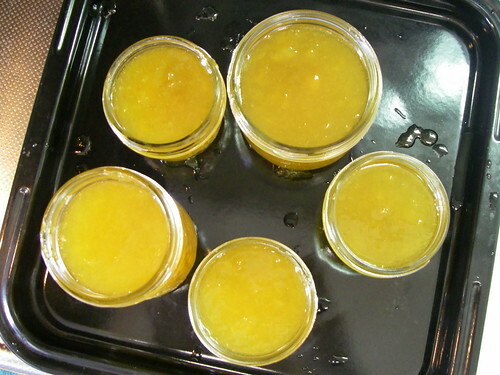 I made mikan marmalade twice in the new year. It set perfectly the first time and the second time I had to use it as mikan syrup (which is great btw). I am going to make momo jam in the next little while. This looks absolutely delicious. I made quince jelly last year (for the first time too) and this recipe reminds me a lot of that. It also was not overly sweet and I just loved it. 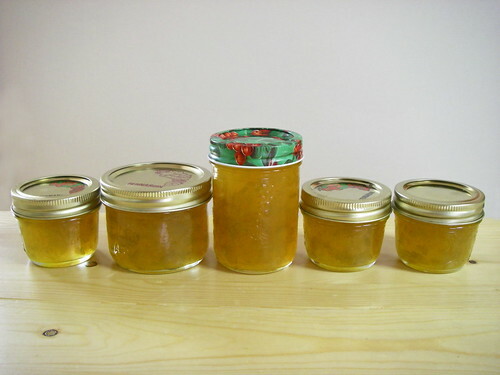 I shall have to try a Ume jam -refrigerator type using pectin from the market. I love ume on just about everything! We grow the Watahira brand Ume plums for primarily the Asian distributors as well as local Korean ume plum wine makers.